My story by Juan Salazar. At the age of 14 years I started working as a farm worker. In the summer of 1972 my father talked me into working under UFW contract. In doing so it was the first time in our life we were treated better by growers, paid better wages, had cool drinking water, two rest periods and other great benefits. Constantly my father and I would discuss what a great union and movement Cesar Chavez had started. Working under contract, I got very involved in union activates. I helped the workers settle disputes with company management. The workers liked what I was doing so much, they voted me to be the President of the committee. 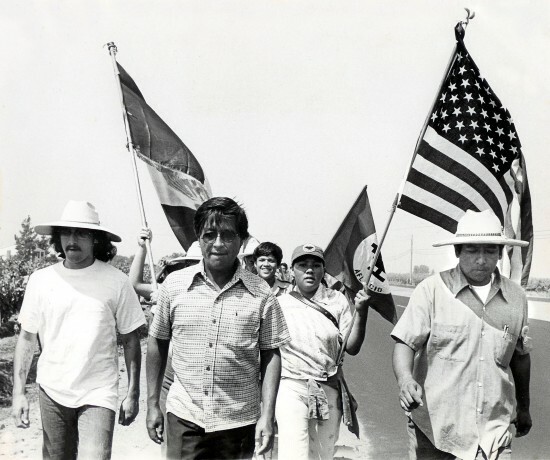 After a few months, I felt I could do more to help farm workers so one day late in 1972 I walked into the Selma UFW Office and said, “I want to volunteer to do what you do.” Little did I know, it was the best decision of my life. For the next 5 years I worked in Fresno, San Jose, Imperial Valley, and Cleveland Ohio. Some of my duties included contract administration, coordinating strikes, boycotts, elections, voter registration drives and organizing workers. In 1973 when the contracts expired the growers refused to renew the contracts. Thousands of farm workers went on strike. Of all the work I did with the UFW, working as Strike Coordinator in 1973 was where I felt a sense of greatest accomplishment. In 1975 during the 1,000 mile march I was honored to have Cesar stay overnight at my home. During the march in Fresno County I was assigned to walk alongside Cesar. A photo of me walking to Cesar’s left was taken near Orosi. It is a photo that I treasure dearly and the one with this story. In 1977 my experience in coordination with the UFW qualified me to get a job with the California Conservation Corps (CCC). In the CCC I moved up the ladder of success until the day I retired after 29 years of service. I owe my deepest gratitude to the UFW which provided me the experience to get a state job. When Cesar died, it was an honor to be asked by the UFW and Cesar’s family to coordinate having honor guards at his side and to provide for his safety during the funeral services for several days and nights. Of all the responsibilities in my life this one was with great sadness, great care and all my efforts to do the best job possible. Now I work in Las Vegas as a Real Estate Agent and planning to become a Broker. I owe my success in life to my experience with the UFW.